No-Wire Walker Basket - Costs Less and Fits Most Walkers! 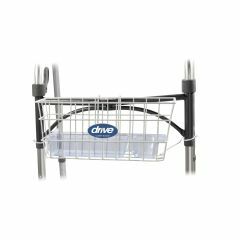 The Drive Medical Walker Basket and available with the insert tray. The basket attaches to all walkers with 1" frames (as seen below). The walker basket is great for holding purses, food, cell phones, keys, etc... Also makes as a great gift to an elderly or disabled person who currently uses a standard folding walker. Poorly Constructed. Supports don't lock. The underlying braces don't lock onto the legs to provide the support needed. It's no better than the broken one we replaced. Handy Basket; Hubby Loves it. Lightweight. Easy to attach. Insert is very handy. Insert is very handy. Basket even holds shoes. OK when walker is folded. The basket works great for my mom. It allowed her more freedom to complete simple task on her own around her home. Which made her feel better about herself and more self sufficient. one thing that i don't like is it is so light duty, that is why i bought replacements, it starts cracking and breaking after a lot of use. Our house has 1 narrow doorway that, if the basket is mounted on the front of the walker as intended, won't fit. I was able to mount basket on inside of walker but without the support arms. Light items ok but basket will come off with heavy items. Probably should have ordered a walker tray.